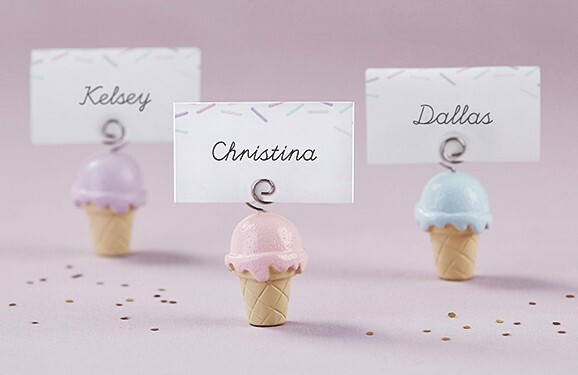 Melt your friends and family's hearts at your bridal shower or baby shower with these ice cream cone-shaped place card holders that won't melt at all! Each place card holder is in the shape of an ice cream cone with a scoop of ice cream and a circle holder on top. The ice cream cone is beige with criss-cross groove pattern and the ice cream is pink, purple and turquoise (you'll get two of each color), and the included blank place cards are white with multicolored sprinkles. PLEASE NOTE: Non-personalized (the pictured calligraphy is an example of what you can write on the place cards). Sold as a set of six (6) and prices quoted below are per set.